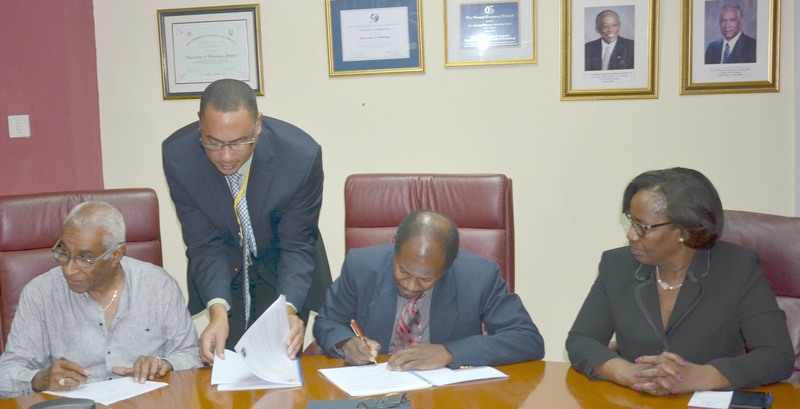 UTech, Jamaica Signs Franchise Agreements with Local Colleges for Pharmaceutical Technology Programmes — UTech, Ja. Participating in the signing of a franchise agreement for select UTech, Jamaica Pharmacy programmes to be delivered at Knox Community College and Church Teachers’ College, (left to right) are Mr. Ronald Graham, Chairman, Knox Community College, Dr. Sean Moncrieffe, Head, School of Pharmacy, UTech, Jamaica, Prof. Colin Gyles, Acting President, University of Technology, Jamaica and Mrs. Monica Dempster, Vice President of Academic Affairs, Church Teachers’ College. Access to academic training and preparation for careers in the lucrative pharmaceutical industry has been significantly expanded, thanks to a newly formalized partnership between the University of Technology, Jamaica (UTech, Jamaica) and two of Jamaica’s well established local colleges. 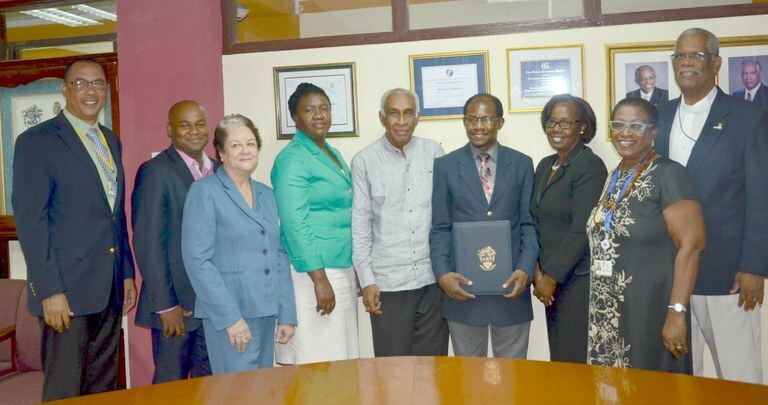 UTech, Jamaica on Tuesday, August 1, 2016 formally signed arrangements with Knox Community College and Church Teachers’ College for the franchising of the University’s four–year Bachelor of Science in Pharmaceutical Technology and the one-year Pharmacy Technician certificate programme offered by the University’s School of Pharmacy, College of Health Sciences. In his welcome at the signing ceremony held at the UTech, Jamaica Papine campus, Acting President, Prof. Colin Gyles noted that “as Jamaica’s national University, one of the things we seek to do is to further national development objectives by responding to needs for training,” adding that there has been an increasing need for pharmaceutical industry professionals to take advantage of the growing niche in the development of pharmaceutical products. He thanked Knox Community College and Church Teachers’ College for seeing the value of working in collaboration with UTech, Jamaica in this regard. Dr. Ellen Campbell-Grizzle, Associate Professor and Dean, College of Health Sciences shared that opportunities abound for students to enter the pharmacy profession either as technicians or as entrepreneurs, given the lucrative growth in the pharmaceuticals, nutracueticals and cosmoceuticals industries. The Dean noted that there is further added value to the pharmacy courses of study as students will also receive training in the Spanish language, making them more marketable in both English and Spanish speaking markets. Head of the School of Pharmacy, Dr. Sean Moncrieffe in his remarks explained that under the franchise agreement, students pursuing the Bachelor of Pharmaceutical Technology will undertake year one of the course at the respective college and transfer to the UTech, Jamaica’s Papine campus to complete years 2 to 4; while the entire one–year Technician Certificate programme will be offered at the respective colleges. Mr. Ronald Graham, Chairman, Knox Community College and The Very Rev. Barrington Soares, Chairman, Church Teachers’ College who signed the franchise agreement on behalf of their respective institutions, both indicated that they were delighted to be partnering with UTech, Jamaica to diversify academic offerings and to extend opportunities for training and certification of citizens in Mandeville, Clarendon and other areas in proximity to both community colleges. The franchise agreements will take effect from January 2017 with the first expected cohort of students. UTech, Jamaica also has franchise agreements with the College of Bahamas at which the first two years of the Bachelor of Pharmacy course of study is offered. The University of Technology, Jamaica has a long and outstanding history in the training of pharmacy professionals spanning 54 years, with a course structure that is similar to the best pharmacy programmes in the world. Graduates from these programmes are to be found all over the globe and are the backbone of the pharmacy services in Jamaica and the wider Caribbean. The School of Pharmacy offers certificate, degree, masters and doctoral programmes. These comprise the Pharmacy Technician programme, Bachelor of Pharmacy programme, Post-Diploma Bachelor of Pharmacy programme (Online), the Master of Science in Pharmaceutical Sciences and the Doctor of Pharmacy. A Pharmacy Assistant short course is also offered. Administrators from UTech, Jamaica, Knox Community College and Church Teachers’ College pose for a group photograph following the historic signing of a franchise agreement between the University and each of the two colleges. Sharing in the happy occasion from left are Dr. Sean Moncrieffe, Head, School of Pharmacy, UTech, Jamaica, Mr. Deanian Scully, Academic Franchise and Outreach Coordinator, UTech, Ja., Mrs. Pamela Kelly, Coordinator, UTech, Ja. Academy, Mrs. Kayon Stephenson-Wilson, Acting V.P., Academic Affairs, Knox Community College, Mr. Ronald Graham, Chairman, Knox Community College, Prof. Colin Gyles, Acting President, UTech, Ja., Mrs. Monica Dempster, Vice President of Academic Affairs, Church Teachers’ College, Dr. Ellen Campbell-Grizzle, Associate Professor and Dean, College of Health Sciences, UTech, Ja. and The Very Rev. Barrington Soares, Chairman, Church Teachers’ College.